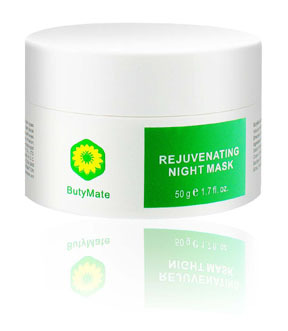 Description (Effects): ButyMate Rejuvenating Night Mask goes on smooth to tone, revive, and rejuvenate your skin. It resists fine lines and wrinkles and renew the delicate and elastic skin. It reveals radiant, soft, and touchable skin by morning. For the best results, use with ButyMate Rejuvenating Toner, ButyMate Rejuvenating Serum and ButyMate Rejuvenating Lotion.